What about Scott Finstermaker, Gitmo & Obama’s promise? Mr. Fenstermaker is a member of the pool of Qualified Civilian Defense Counsel, authorized to represent the detainees at Guantanamo Bay, Cuba before the Military Commissions being conducted at Guantanamo Bay. He has a secret security clearance and is available to represent clients involved in national security-related issues. Mr. Fenstermaker has experience litigating pursuant to the Uniform Code of Military Justice and is prepared to assist service members confronted with issues within the military criminal justice system. Who controls the representation of the defendent? TP: Why won’t you represent Ali Abd al-Aziz Ali when he stands trial in New York for the September 11th attacks? SF: The government would not let me represent him. SF: Well, that’s a good question. 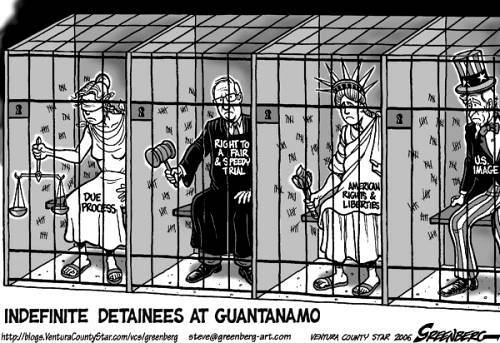 The government goes crazy every time the detainees want me to represent them, and the government doesn’t like it. TP: How does the government prevent you from representing the detainees? SF: The government wants to control who represents the detainees. The government not only wants to, but it is. The government does this by controlling the judges. The judges are doing exactly what the government wants them to do in these cases. The judges ask what the government wants them to do, and then they do it. Today I have signed into law H.R. 6523, the “Ike Skelton National Defense Authorization Act for Fiscal Year 2011.” The Act authorizes funding for the defense of the United States and its interests abroad, for military construction, and for national security-related energy programs. Section 1032 bars the use of funds authorized to be appropriated by this Act for fiscal year 2011 to transfer Guantanamo detainees into the United States, and section 1033 bars the use of certain funds to transfer detainees to the custody or effective control of foreign countries unless specified conditions are met. Section 1032 represents a dangerous and unprecedented challenge to critical executive branch authority to determine when and where to prosecute Guantanamo detainees, based on the facts and the circumstances of each case and our national security interests. The prosecution of terrorists in Federal court is a powerful tool in our efforts to protect the Nation and must be among the options available to us. Any attempt to deprive the executive branch of that tool undermines our Nation’s counterterrorism efforts and has the potential to harm our national security.